There is no gold in Blue Goldstone. All Goldstone is man-made glass infused with copper particles; the additions of cobalt, manganese or chromium result in the deep, shimmery Blue Goldstone. It was invented by the Miotti family in Venice during the seventeenth century. 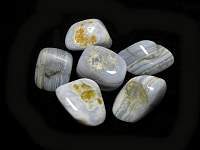 And, because glass is made from quartz sand-silica, Goldstone has found its way into the metaphysical and healing community. Use Blue Goldstone to make a wish. It strengthens decision making and helps achieve goals. Keep a piece with your resume or at your work desk to increase job opportunities or better advancements in your career. 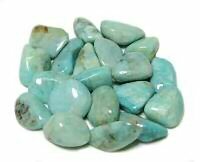 It is supposed to assist with purifying energy and protect people from negative energy. 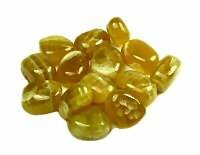 The sparkle of the stone is supposed to bring out your positive power. It will change your negative thoughts into positive ones. It gives one courage and self confidence. 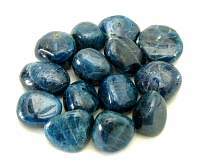 Blue Goldstone is a helpful aide for children who are afraid of the dark. 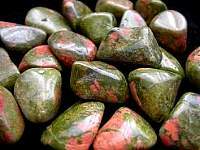 Goldstone, is a good deflector of unwanted energies, and is highly regarded in the spirit realm as a protection mineral. 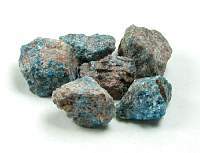 Metaphysical healing lore says that Blue Goldstone is a nervous system stimulant and enhances transmission of healing energies. 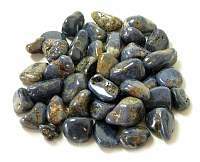 Blue Goldstone eases headaches, migraines, helps with eye ailments such as glaucoma or tunnel vision, and alleviates allergies derived from pet dander or dust. I usually don't carry man made crystals but have gotten so many requests that I decided to add this to my store. I have to say these are really pretty!